There are any number of instances when locating a stud or other framing member behind a finished wall or ceiling surface is useful. For example, when anchoring a wall cabinet, it's crucial to secure the cabinet to established framing members, not just try to hang it from the drywall. Heavy wall hangings, chair-rail molding and other items are also best anchored by securing them to studs. Of course, you can use a magnetic or sonic stud finder to locate a stud (more on that later), but you should also be aware that there are easier (and less expensive) ways you may be able to locate a stud. In fact, in many cases you can locate a stud without even powering up the stud finder. The nature of house framing is that you will ALWAYS find a stud at each inside and outside corner in a room. Fine, but considering that we rarely need to attach anything in a corner, where do we go from here? Read on for several ways to locate wall studs. Beginning at the corners, house framing generally positions studs spaced every 16" on center. There are instances where the walls are framed differently--such as when the studs are built from 2 x 6 lumber--but in most houses, the 16" on-center rule will apply. So, beginning from the corner, or measuring from anyplace you've already located a stud, you can measure in multiples of 16" to identify the likely location of other studs in the wall. In fact, carpenter's tape measures usually have the 16" increments highlighted in red to make this easier. While this technique gets you to the general location of the next stud, it's not accurate enough to start pounding nails. You'll want to pinpoint the location a little more precisely. Studs will normally be spaced every 16" along most walls in residential construction. The other known fact in house framing is that window and door openings will always have studs along the sides. In fact, they will often have two doubled-up studs--​known as a king stud and a sister stud--to make the opening extra sturdy. You can always find a stud alongside a door. You can always find a stud alongside a window. There are also framing members located above and below door and window openings. Horizontally, there will be a framing member known as a header above a window or door opening. Often these are pairs of 2 x 6s turned on edge. Below a window opening, there is also a horizontal sill plate. Both of these can be screwed or nailed into to anchor items to a wall. Also extending above a window or door opening, and below a window sill plate, there are short vertical studs known as cripple studs. Studs or other framing members are found above and below doors and windows. In new construction, electricians usually nail the electrical boxes for light switches and outlets onto the sides stud. This can help you find the general location of a stud in a wall. But note that it's not immediately clear on which side of the box you'll find the stud. For this, you need the stud finder. Or, if you simply take off the cover plate for the switch or outlet and peer inside, you may be able to see in which direction the box has been nailed. It's important to know that not all electrical boxes are nailed onto studs. 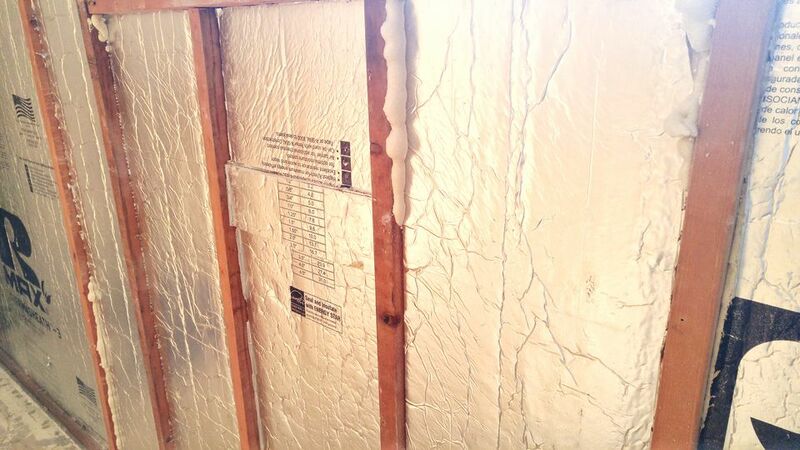 Some boxes--called retrofit or old-work boxes--are mounted directly in the drywall. Studs can be found adjacent to most switch and outlet boxes. While the above tips can help you estimate the general location of a stud, for greater accuracy, you can drive a thin finish nail or small-diameter drill bit into the wall. You may have to punch a small row of tiny nails in order to find the stud, but these are very easy to spackle over and paint after you're done. One advantage to using a drill bit is that you may be able to spot the wood fragments on the drill bit when you hit the solid wood stud. If this is the kind of task you do often, though, you may want to buy a stud finder. These tools come in two forms. First, there is a small magnetic tool that will sense the location of metal nails or screw heads used to anchor the drywall to the studs. These are a little tricky to use, though, and only will register the location of the stud precisely at nail or screw locations. A better method, though, is with an electronic stud finder, which works by sensing the wall density. Place the stud finder about 6" to 8" to the left of the general location of the stud. Press the button on the stud finder and slowly slide the stud finder to the right. When the stud finder indicates that it has located the stud (usually with a red light or a beep), immediately stop moving the stud finder and mark this spot with a pencil or scrap of masking tape. This is the left side of the stud. Now repeat this process from the right side of the stud location, moving the stud finder to the left, and marking the point where the finder beeps or lights up. You've now identified the right edge of the stud.